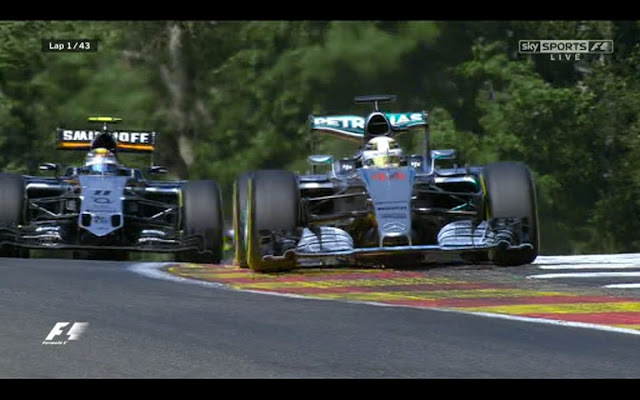 Axis Of Oversteer: Hamilton wins Mercedes class, Ferrari's gamble doesn't pay off. Hamilton wins Mercedes class, Ferrari's gamble doesn't pay off. The 2015 Belgian GP would have been a great race without the two Mercedes but there is no rule against dominating is there? Lewis Hamilton proved once again he is the fastest Mercedes driver after the only other car in the same class botched the start. As we've see in past races, the only chance anyone else on the grid has is to pass the Mercs on that first lap. Sergio Perez almost pulled it off but perhaps he was a bit too "honest" at Raidillon: where Hamilton put all four wheels off outside the white lines, straitening out the turn, Perez stayed within the limits losing out that little extra that allowed Lewis to stay ahead at the end of Kemmel. You can't blame Hamilton for taking that line, the FIA has decided on selective track limits enforcement and most of the field abused the curbs there. After that first half-lap the race for the win was all done. Rosberg never really had anything for his teammate who further humiliated the German on the podium telling the world how he "allowed him" to get as close as he did... Ouch. The other big story was Ferrari's one stop gamble. Vettel said Ferrari had gotten assurances from Pirelli the prime tire would last way longer than the 28 laps it did before exploding. Pirelli shot back they meant it's possible but not recommended. Certainly two right rear failures at high speed on two different cars on tires that were far from chorded is odd though it's hard to believe the much abused curbing at Raidillon was not a factor: just before the failure, Vettel hit it very hard with attempting to keep Grosjean's Renault behind on the final lap. Ferrari has not been happy with Pirelli all year, keep an eye on this story. That said, glad to see the Scuderia go for it rather than accept a 4th place. 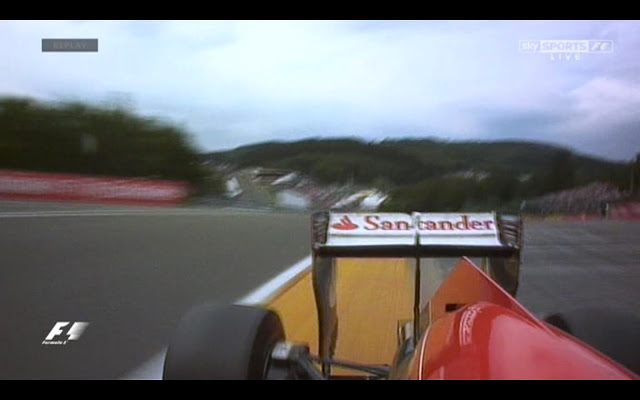 Still, even if the strategy had payed off, Vettel was almost 40 seconds adrift of the Mercedes. A hard wake up call for Maranello after the win in Hungary. If Lotus, Red Bull and Force India were the surprises at Spa, Williams has to be the biggest loser: It was supposed to be one of their track but the best they could do was a fortuitous P6 with Massa after the incredible mistake of mounting three options and one prime on Bottas'first stop. The chances of Mercedes not winning in Monza in two weeks is essentially nil. We'll still watch but stick a fork into this championship, it's done.